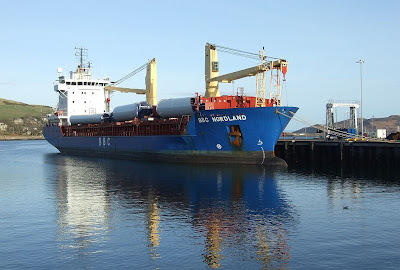 Basking in the sun at Campbeltown today, with a full cargo of locally built wind turbines from the Vestas-Celtic factory, the Gibraltar-registered BBC NORDLAND gets ready for sailing. Built in 2000 at Gdynia in Poland, she is owned by Briese Schiffahrts, and is 107.75 metres in length. According to this information sheet, her deadweight of 7,616 tonnes gives her a maximum load draft of 7.5; the New Quay at Campbeltown has a minimum dredged depth of 5 metres at low water! This pier was recently rebuilt by Argyll and Bute Council to accommodate ships like this calling to load wind turbines. Great lighting for these photos, very nice. Nice to see a Campbeltown vessel, don't see many vessel photos from there even though I know the resident all-encompassing ships' agent there...must get him better educated!